This is first part of WordPress basics tutorial. The lessons will assume that readers have no previous knowledge of using or working with WordPress. So and every aspect will be described in details. I will touch every aspect of the framework from basics. With every lesson we will dive into more details. In this post I will be covering basics like our blog setup and understanding this framework and why to use it.We will also see alternatives of this framework.So let us get started. Before diving into details of WordPress lets understand it first. Understanding it will help you make decision. It is very important to understand a framework before using it. In technical terms WordPress is Content Management system in short CMS. CMS is framework to manage your content like text , images and videos. Images , Videos and text is important part of every website. You can not image a website without them.. It is the technology which enables you to put these three content online can be different. Content Management Systems are those frameworks which enable you to put these content online. You can focus on creating images or videos and writing articles. You need not worry about the technical details. CMS is used to create your own websites, blogs, forums, eCommerce sites and any other type of site you can think of. WordPress is by far the most popular content management system. Other notable CMS are Joomla and Drupal. 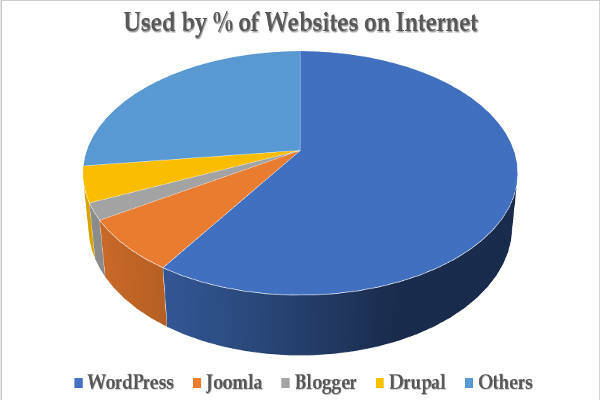 Below graph shows different CMS used by websites . You can see popularity of different CMS among website owners. Lets understand the features by example. To create a website you have to code from scratch. It involves lots of coding , design work and testing. The amount of time required is huge. You need a team to create a website. But with WordPress you just need to install it. After successful installation you will have a working website. You can add content on your site. That is you can add photos , videos and articles. You can set up a working blank site in one day. You are cutting your development time. Ease of Use It helps you get online and running in shortest span of time. You can eliminate development and design effort and concentrate on your content. It is simple to use.It has very low learning curve. Community It has more than 50K free plugins to extend functionality. 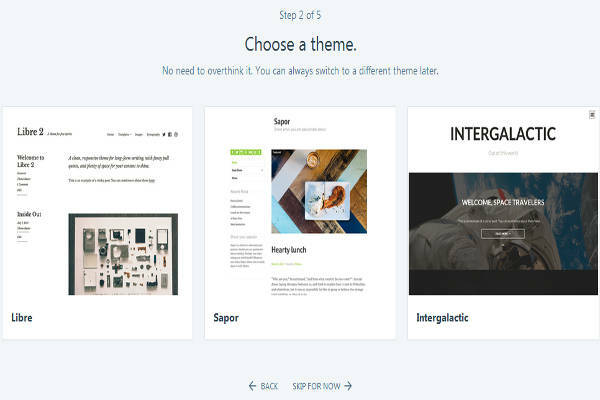 We will discuss meaning of Plugin later in this article.It has more than 10K free themes to choose layout of your site. We will discuss meaning of Themes later in this article. Documentation and Support It is very easy to find WordPress developer.The internet is full of articles and resources if you want to learn it. This lessens the learning curve and helps in easy adoption. The answer to this question helps you understand power of this framework. Many of the fortune 500 companies are using it to power their blogs. Many top sites across the Globe is using it for their full blown websites. You can find every type of website created in WordPress. In this link you can browse through top websites using it. I am including few names below to give you an idea. The framework which is trusted by these big names of industry is surely powerful and flexible enough to power your new website or blog. Moreover you can browse through different type of sites created with this CMS using the link I shared above.That will also give you idea whether it fits your vision of new website. Lets see the technology behind it. The programming language and database it uses. It may be another deciding factor in your decision making. Note if you do not understand some of the technical terms then do not worry you can ask me or ignore for now. PHP is popular easy to use programming language. MySQL and MariaDB are free Database Management System. There is no need to learn these two. You can still run WordPress website without knowledge of either PHP or MySQL. WordPress stores the information in MySQL tables. It uses PHP to fetch data from MySQL tables. The fetched data is converted into HTML. The HTML is then displayed on browsers. Lets understand the work flow with an example. You have opened this URL in web browser. WordPress fetches data using PHP from MySQL table for this URL. The data is converted into HTML. The HTML is then displayed on the Browser. You are seeing HTML version of the page. Where can you host WordPress site? Most hosting companies provide infrastructure to host WordPress site. So you should not really worry about hosting. There are two widely used terms with respect to WordPress hosting. Self hosted installation means you have downloaded WordPress and installed on your own server. It can be downloaded for free from this link. You can install it on your desktop or laptop. It may be also any hosting company out there. For Self hosted installations you will have to buy hosting space from hosting companies. It is preferred if you have decided to use WordPress for your next site. Most of the hosting providers provide one click WordPress installation. I am not covering self hosted installation as it differs from host to host. You can contact hosting company and they will set it for you. However I would recommend below hosting company for reasons mentioned. Bluehost – Bluehost is mentioned as preferred hosting partner on official website of WordPress. They offer one click WordPress install. So you can get your site setup in minutes. You can decide on your domain name and select the hosting plan to get started right now. Note It is recommended to use self hosted installation. It gives you more flexibility and power.So after test drive you should select self hosted installation. You can also create a free blog on WordPress.Com. I would recommend creating a free site. That will help you learn internals of the framework. You can play around or read this series with free account. That will help you get more insight. You can then decide whether you will be using WordPress or any other solution for your website. The step by step process to create free blog is given below. Click on this link. A new window will open. On the new window you will have to select between different options. You can select either blog or website. Click on Start with a blog option. Note you are not really hosting your site for now. You are just creating a free site for learning purpose. The second step is choose a theme. We will discuss the term theme later on. You can click on any of the theme image for now. If not sure you can click on the Skip for Now link. Note the themes displayed to you may be different than that shown in below image. There is no need to worry about. In this step you will have to give address of your site. You can give anything here. Note even if you have a domain name do not mention it here. You can use something like your name or name of new site you will be launching. As soon as you enter the domain name it will show whether it is available or not. If someone is using that name then you can not use it. You will have to use different name. The name suggestions are also presented. For example Udinra is already taken up by me. So udinra blog was suggested. Similarly you can select the free alternative suggested to you. Note click on Select not on upgrade. On this page you will have to select plan. There are four plans available. The page gives comparison of features available in all plans. For now select the free plan. Click on the select the free plan. This is the last step. 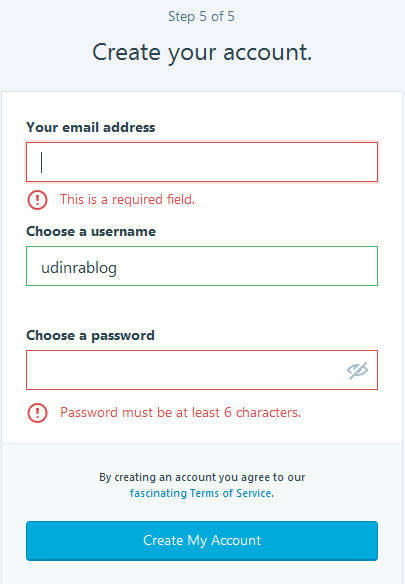 You need to use a valid email address and password. 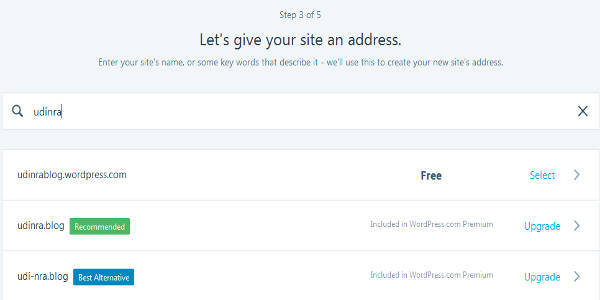 After this step you have creating a free blog on WordPress.com. From above discussion it is clear that WordPress is most preferred way to create your website. But there is chances that you want to explore other frameworks before sticking with WordPress. For those reader I am presenting list of top content management systems. I will list out only frameworks which require less development effort. These frameworks are more like WordPress. You can get your website up and running in short span of time. Joomla is second in popularity. It is also PHP and MySQL based framework. You can free demo Joomla website for 90 days on this link. On ease of use it is next to WordPress. It is also very powerful and powers some of the best website out there. you can test drive this framework and see if it fits in your need.If you are starting out online venture then this is second best choice available to you. I would not recommend Drupal if you are starting your online venture. It is most advanced and complex CMS. It needs some technical knowledge and the learning curve is also present. This is last choice you should turn to. Most of the Government sites use Drupal because of its security and power. Like Self hosted WordPress installation you can also have self hosted Joomla and Drupal installation. Most of the hosting companies provide infrastructure required for Drupal and Joomla. The server or technical requirements for WordPress, Joomla and Drupal are same. 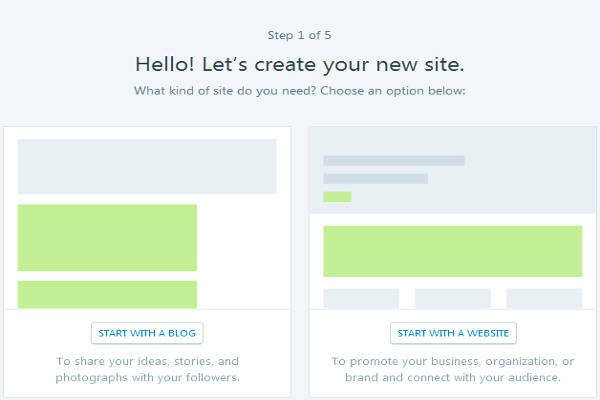 Above are the preferred options to get started with your blog or website. I have presented them in order. You can also read list of other website who allow you to create blogs for free. I next chapter I will cover self hosted WordPress Installation in details. So you ca either use free setup or self hosted set up for rest of the tutorial. Previous Previous post: Sitemap Are you using them correctly on your site?